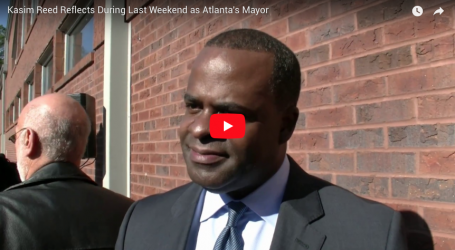 “I AM 2018” CAMPAIGN TO MARK 50TH ANNIVERSARY OF SANITATION STRIKE IN MEMPHIS AND THE ASSASSINATION OF DR. MARTIN LUTHER KING, JR. – Newsmakers Live! “I AM 2018” CAMPAIGN TO MARK 50TH ANNIVERSARY OF SANITATION STRIKE IN MEMPHIS AND THE ASSASSINATION OF DR. MARTIN LUTHER KING, JR. 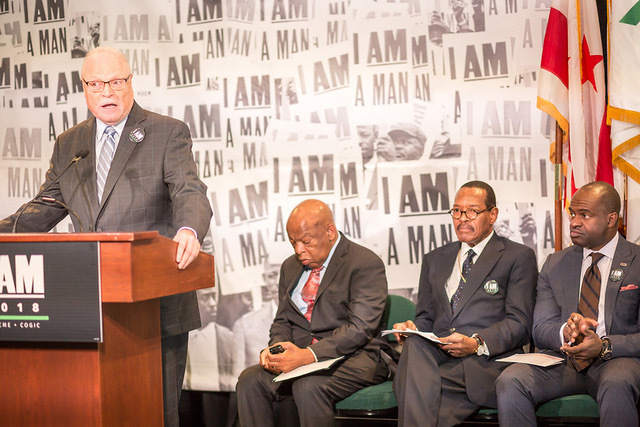 IN MEMPHIS AND THE ASSASSINATION OF DR. MARTIN LUTHER KING, JR.
AFSCME President Lee Saunders stresses the importance of the “I AM 2018” campaign at AFSCME headquarters in Washington, DC as Rep. John Lewis, COGIC Presiding Bishop Charles E. Blake, Sr. and NFL Players Association Executive Director DeMaurice Smith listen. nd the Church of God in Christ (COGIC) are embarking upon a major commemoration of the 50th Anniversary of the Memphis sanitation workers’ strike and Dr. Martin Luther King’s final “Mountaintop” speech; events that led up to Dr. King’s assassination and transformed the civil rights landscape forever. 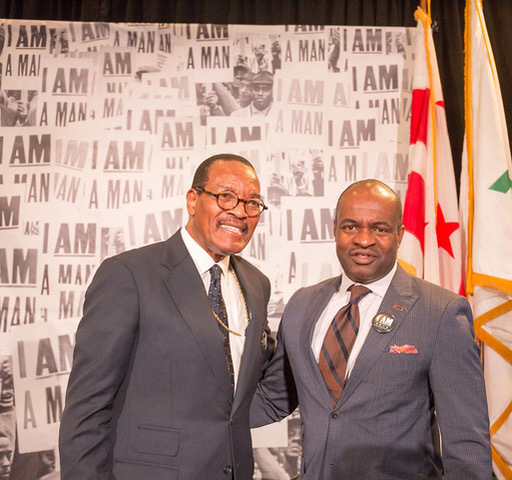 On June 27th, AFSCME and COGIC launched the “I AM 2018” CAMPAIGN, designed to connect the legacy of the strikers and Dr. King to the current issues facing our nation. 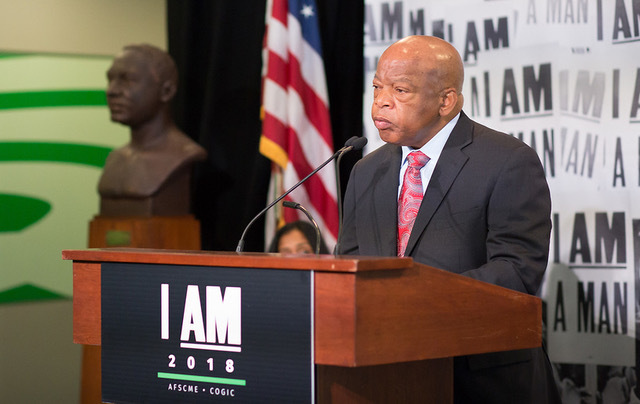 Representative John Lewis offers his thoughts during the June 27th launch of the “I AM 2018” Campaign in Washington, DC. 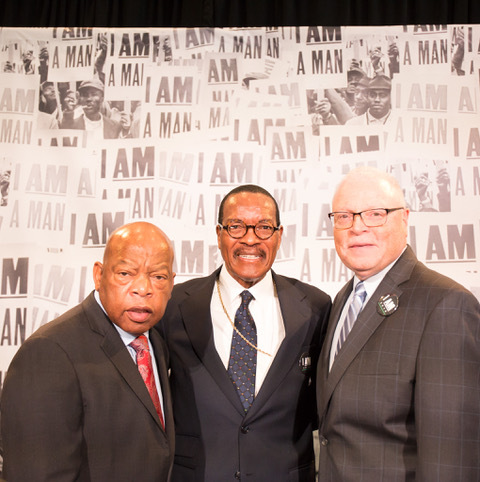 Rep. John Lewis, COGIC Presiding Bishop Charles E. Blake, Sr. and AFSCME President Lee Saunders at the launch of the “I AM 2018” campaign at AFSCME headquarters in Washington, DC. g the 1960s, one of the most transformative chapters in the civil rights movement was the close collaboration between religious, civil rights and labor organizers – the same spirit I AM 2018 seeks to create. “By attacking problems, in communities across the nation, from these interrelated perspectives simultaneously we maximize the likelihood of success,” added Bishop Blake. Leading up to events planned for April 2, 3 and 4, 2018, the campaign will focus on training and mobilizing youth activists and organizers to work in communities nationwide – addressing the issues civil rights, labor rights, and economic justice. There will also be a wide range of other activities taking place between now and April, including town halls and trainings. 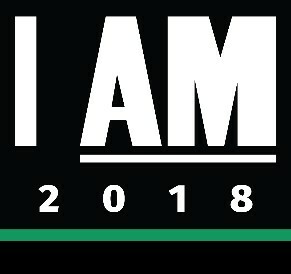 For more information on the “I AM 2018” CAMPAIGN, go to https://www.iam2018.org. COGIC Presiding Bishop Charles E. Blake, Sr. and NFL Players Association Executive Director DeMaurice Smith. 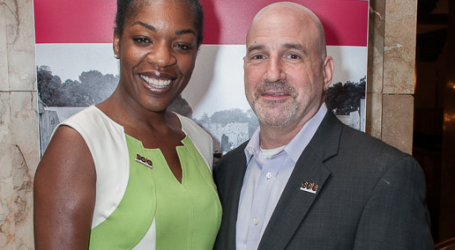 AFSCME’s 1.6 million members provide the vital services that make America happen. 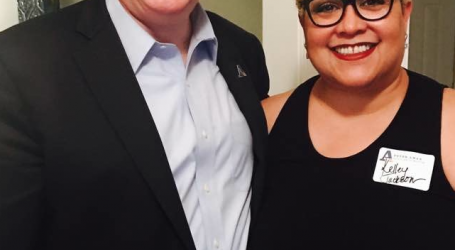 With members in hundreds of different occupations – from nurses to corrections officers, child care providers to sanitation workers – AFSCME advocates for fairness in the workplace, excellence in public services and prosperity and opportunity for all working families. The Church of God In Christ is the largest African American Pentecostal denomination with 8.3 million members worldwide and 12,000 churches in the United States. Bishop Charles Blake’s home church, West Angeles Church of God In Christ in Los Angeles, has 24,000 members and is one of the largest congregations in America.